One of my highlights from lift was a chance to meet Riccardo (who’s already been thoroughly adopted by the TorCamp swarmth) and then Lee Bryant from Headshift. Lee gave a fantastic and passionate speech on enterprise collaboration the first day of the conference. That modern state of enterprise IT is a mess. Why are we feeding the machine (the systems the databases, the KM repositories) instead of feeding the minds of it’s people. 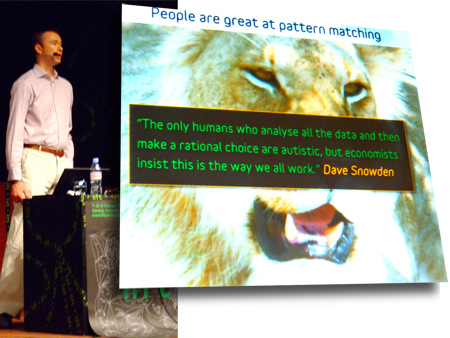 1. he showed a picture of a lion and told us how good the human mind is a pattern matching. When we see a lion in the wild, we don’t attempt to interpret this new information construct an SQL query in which we select from the knowledge base all objects, that are yellow, have fur, bear fangs and try to interpret. No, our neural network is better than that. The instant we see a lion, we scream lion! and run. 2. Why can’t enterprise fully leverage the human pattern matching and filtering of their thousands of their real working human minds? 3. [Echoing O’reilly latest tune] The value of Enterprise Social Software is that these tools get better the more people there are using it. And this is clearly opposite of how Intranets and corporate IT are working for enterprise today. 4. It puts to much emphasis on storage. Storing data and capturing knowledge, when in reality what people are often more concerned with is the immediate context. What is happening, what conversations are going on in the company Right Now? 5. He talked about applications like wouldn’t be great to know what news or articles or conversations on a certain subject is getting the attention of, say, your team, or the senior partners… this morning? Every Banks should listen to Lee. His basic premise; there is wasted brainpower in large corporations. Its turning people into idiots. and Colin’s part 2 notes here banks are handicapped by perceptions. 1) that social bookmarking is necessarily the killer app. I agree with the immense value of the social value of the streams of meta data – through tagging and connecting semantic relationships, as well the attention data. However, as a user, I’ve always hated the traditional formating of tag clouds the idea of sifting through other people’s delicious/magnolia feeds yuck. I think we need better user tools for this. 2) that you need a 1000 people for enterprise social media ecosystem. Comparing to wikipedia or other consumer mass collaboration paradigms is a complete red herring. At firestoker, starting with a shared-conversation paradigm for social software, we’ve seen the value in tagging not bookmarks but threaded conversations in organizations for 500 people all the way down to (almost surprisingly) 2 to 4 individual users at a time. This entry was posted in Uncategorized on February 14, 2007 by Thomas Purves. Re tags/ social bookmarking: I’d say we are just scratching the surface, but they may at least be a strong component in the killer app. At the simplest level, tags will make information easier to locate later, and group similar information in humanistically natural ways, vs the library system.